The Royal Toby Restaurant is quintessentially British. Serving quality ingredients in a traditional way, allowing the produce to shine. All our meat is prepared in our own butchery. This gives us great confidence and pride in the dishes we serve. Originally, the dining room was designed as a grand ball room. The stunning ceiling and chandelier give the restaurant a great deal of grandeur. The Study at the rear of the main dining room offers a facility for large parties. Although this was originally a cocktail bar, it now serves as a great space for large family gatherings. All of our produce is carefully sourced to ensure the best ingredients are used in all of our dishes. From breakfast to Sunday lunch, all of our dishes have been delicately planned to provide great flavour without breaking the bank. Watch out for the Early Diner menu. and enjoy a lovely meal, without breaking the bank. Our Early Diner, Later Dinner offers a fantastic selection of dishes with choices for everyone. The pub gets really busy at lunchtimes, so our pub menu can now be enjoyed in the restaurant. We have a great selection of bar snack classics for you to enjoy at lunchtime. Our Sunday lunch is a real family treat! Come and enjoy a traditional British Sunday lunch, without the hours of cooking and arguments about washing up. The study is perfect for large groups of diners. If you are celebrating a birthday, anniversary or special occasion, we have a great range of set menus available for large groups. Please be aware we cannot always guarantee the study for private dining. During peak times the study maybe used for multiple parties. Speak to our team who will be happy to advise how we can best accommodate your party. "The restaurant is in a lovely old building with a domed ceiling and wood panelled walls which has a nice comfortable yet elegant feel. There is plenty of choice on the menu and the food is nicely presented and delicious." 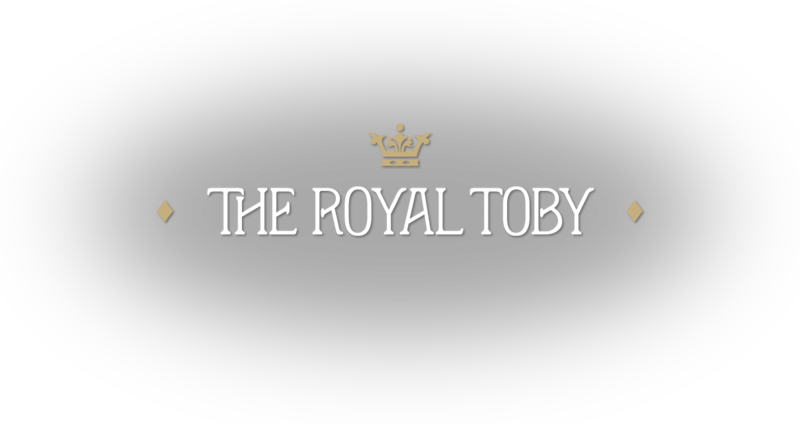 "As a local, I have been visiting the Royal Toby for years. I love the place- it's a very welcoming establishment which consistently delivers excellent food & service. Staff are friendly & the food is always good- it has a great British menu with lots of choice. The steaks are fantastic! " "What a lovely experience! The staff were incredibly friendly and helpful and the place was very clean and well kept. Breakfast was lovely with a good variety for the continental, and the cooked breakfast was served piping hot on hot plates. Would definitely recommend this hotel. " Are you looking to hold a special event? then look no further and click the links below to get started.